Wishing I had some sort of crib sheet to these comics bequeathed to me. I’ve had to bounce back and forth a few times between Mutant Massacre, spinoffs and the like, but I think I might be on the right track here, at least for the next few issues. Of course, this episode takes place after the Mutant Massacre issues, but before the debacle that was Fallen Angels. I’ve started in with some pretty late issues here, but X-Factor is a decidedly differently take on the mutant stuff that’s going around at the time. Not as serious as the X-Men, and not as angsty as the New Mutants, by far. It’s got quite a lot of humor and more slapstick that I’d have expected. I don’t mind our original core X-Men in their own book, either; however, it’s hard for me to wrap my head around Scott not being with Jean, and with someone who looks just like her. So, they were X-men, but now they’re not. They’re not the New Mutants, either. They’re not the Marauders or the X-Terminators, though they sometimes dress up like them. They’re X-Factor, mutant hunters with the government, but they aren’t really hunting them. They take mutants in so they can help them learn to use their powers properly. Confusing world in which we live. Angel is in the hospital because his wings were pretty much demolished during the Mutant Massacre. Jean and Scott are taking this pretty hard, probably because they’ve got their own mess to be cleaning up. To be chill with Angel losing his wings and making him a “normal” human again (when they’re mutants themselves) can’t be easy to take, either. Boom-Boom is having a hard time keeping the Vanisher off her tail, even though he’s the leader of the Fallen Angels which she’s a part of. So she calls X-Factor to help sort things out. 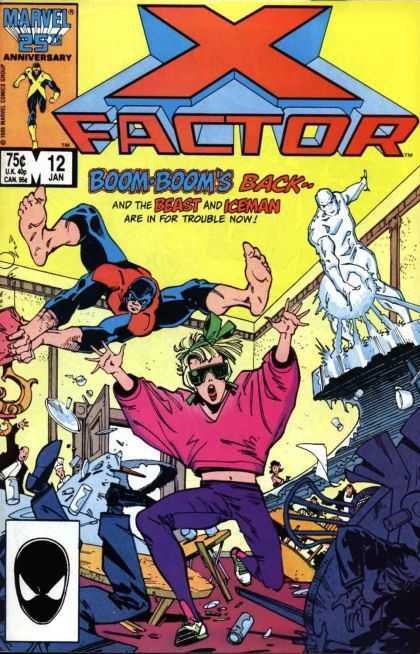 Boom-Boom gets pretty tricksy with Beast and Iceman as she drops an explosion down the back of Iceman’s shirt. Boy, this girl falls for the guys fast–as can be also seen in her time in Fallen Angels. Jean and Cyclops have some words as they bicker back and forth over why they aren’t calling their various family members. Jean’s sister has spoken out in support of the mutants, something which has gotten people attacked recently. Having no answers via telephone, Cyclops and Jean travel to Jean’s sister’s place, only to be firebombed themselves. This all leads into an issue of Uncanny where Storm and Wolverine make a search for the sister…and Jean. Again with the crib sheet. There is a nice use of powers here as Jean does what we all wish we can do sometimes: telekinesis our phone right to our ears. Oh, and Apocalypse finds himself his third horseman, Famine.